Brand marketing habits are changing in Facebook's favor—at least when it comes to posting and playing videos—part of the social giant's grand video plans. Budweiser, McDonald's and even Beyoncé are now posting videos directly to the social network—not just sharing YouTube links—and it's leading to a digital power shift. In short, YouTube clips, once ubiquitous on Facebook, no longer dominate on Facebook's feed, which is siphoning some traffic from Google's popular video site. Taking traffic from YouTube also means taking away potential ad dollars, especially now that Facebook is focusing more on video advertising. "It's such a smart play because it's the most natural next step in slowly taking over video," said Robert Sandie, CEO of online video tracker and consultant vidIQ. Facebook has identified video as a core growth area for its platform—similarly to how Yahoo, Twitter, AOL and Google all vie for views. Now, when a marketer posts content to Facebook, it has the option to use the homegrown video function—which automatically plays and appears most naturally in the News Feed. The change happened quickly over the past year since Facebook introduced autoplay video widely on the network. "The autoplay feature allows us to increase engagement and exposure with millennials in an undisruptive way, as our content is integrated into consumers' News Feeds naturally," said Lucas Herscovici, vp of consumer connections at Anheuser-Busch. Social media tracker Socialbakers offered some evidence of the shift. In January, McDonald's posted 27 videos to Facebook, 18 of which were YouTube links and the rest native Facebook videos. In September, it posted 32 videos, of which 19 were Facebook videos. In May, Budweiser posted about 60 YouTube videos to Facebook, of which fewer than 10 videos used Facebook's functionality; in September, those numbers flipped. "Facebook wants to keep that traffic," said Socialbakers CEO Jan Rezab. Posting directly to Facebook also increases engagement, added vidIQ's Sandie. KLM Royal Dutch Airlines got the message. Its latest video was posted to YouTube and Facebook separately like many brands are now doing. Fans engaged with KLM's latest YouTube video 300,000 times, with likes and shares, but they engaged 350,000 times on Facebook, even though it received fewer views, Sandie said, adding, "This shows the power of native marketing on Facebook." One doesn't necessarily replace the other, though. 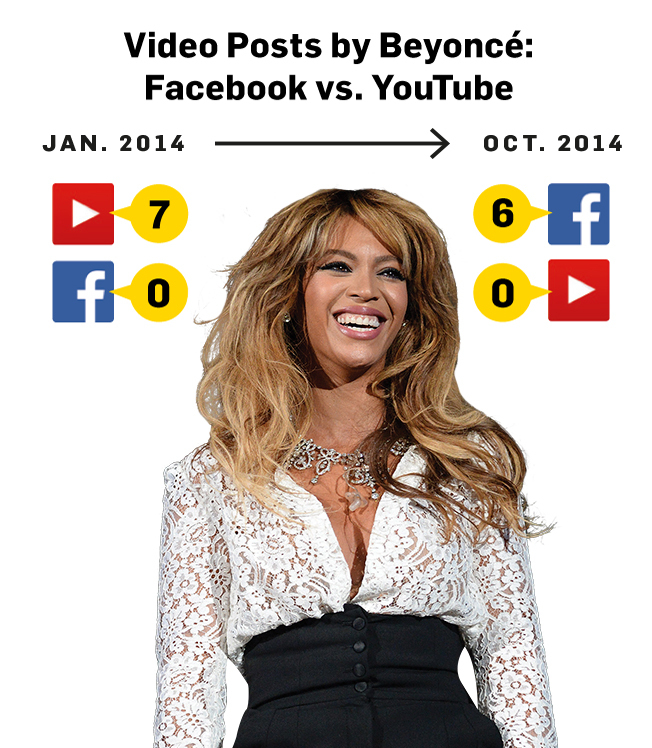 YouTube still generated engagement from other social networks, deriving traffic from Twitter, LinkedIn and Reddit. YouTube declined to comment. The impact of Facebook's power play and brands' marketing strategies will become much clearer in the lead-up to Super Bowl XLIX on Feb. 1, Sandie said. YouTube has long been the place for posting early looks at Big Game spots. Facebook will most certainly use its pull to keep viewers focused on their News Feeds there. "Apparently that algorithm right now is heavily encouraging brands to upload videos natively through Facebook," Sandie said.